We are well and truly gearing up to the last few weeks of Christmas shopping! Eeeek. Not too long until the big day, are you prepared? We still have quite a bit to do, but we always like to go that one step further with some of our favourite people and get personal! If you're anything like me, opening a gift from a loved one that is a little more personal means such much more. It shows that they have put a lot of thought and love into a gift for you. My daughter is a big fan of personalised gifts and loves to spell out her name or see her little face on a cup or cushion. So whether you're looking for something a little special for your mum, dad, wife or even your little one Funky Pigeon will have something for you . We’ve always been fans of Funky Pigeon and have used their personalised cards for years, but we have never tried any of their products or their Christmas range. With an amazing variety of mugs, cushions, canvases, there are countless designs, colours and choices of personalisation. This year we wanted to get something a little special for some favourite of ours and decided to get a personalised canvas made. Funky Pigeon have an extensive Christmas range where you can find a wide range of unique and personalised Christmas gifts. There are so many designs to choose from, whether you’re looking for a funny Christmas gift to make them laugh or something personalised for something extra special. In their Christmas section, you’ll find a huge mix of ideas from personalised gifts to novelty presents and more. There are plenty of ideas to choose from so if it's for secret Santa, a stocking filler or a thoughtful gift for that special someone I kn ow you'll be able to some inspiration. All that can be personalised with photos or a message to make your present their favourite. 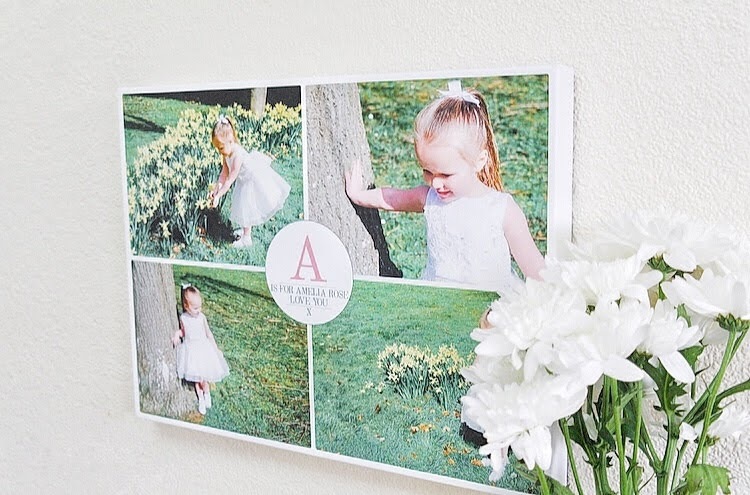 For our gift we decided to get a gorgeous landscape canvas print with four photos. The design will wrap around the edges of the canvas and this particular canvas comes in three size 30 cm x 20 cm, 40 cm x 30 cm and 60 cm x 40 cm. Funky Pigeon was so easy to navigate around making it so easy to pick and choose my design of the canvas. Uploading my images was pretty straight forward too, along with choosing my size and checking out. I must admit I was quite surprised at how quickly I could create my own personalised canavs! It’s so simple. 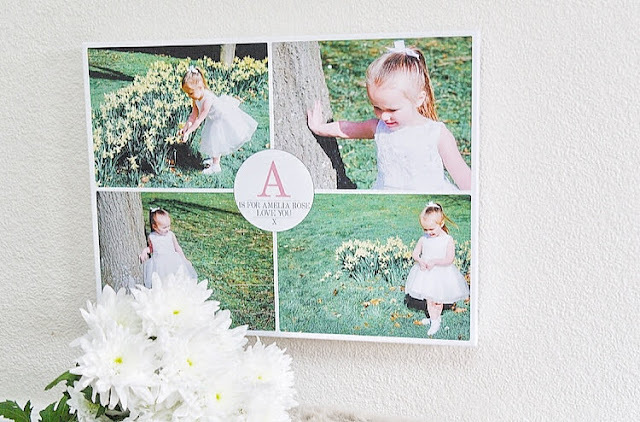 We chose a 30 cm x 20 cm print with a white edging. 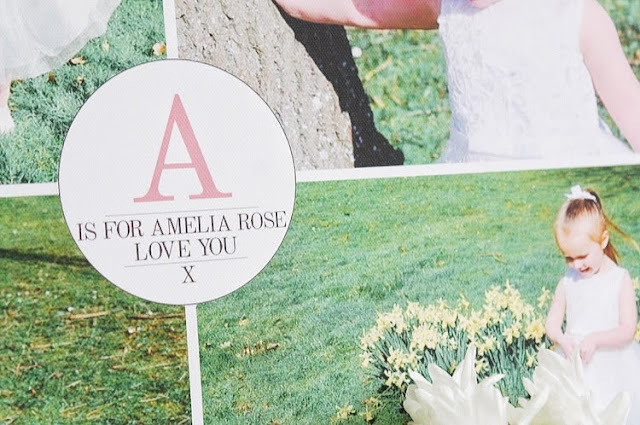 At first we uploaded our photos and then we personalised the canvas text with 'A is for Amelia-Rose'. More people are choosing to add canvases into their homes, but when it comes to buying they can be quite costly. The bigger the canvas the more expensive they can be. However, I have found that all the canvases on Funky Pigeon are reasonable in price. The delivery is super fast and you are provided with tracking information and continuous emails updates along the way, ensuring you are kept up to date throughout. I couldn’t be more pleased with the quality, as it was perfect. The image was clear and the colours are beautiful. Funky Pigeon is so simple and easy to use, you can pretty much design your own canvas in less than five minutes. I also love the fact that delivery is super quick and the quality is outstanding! If a canvas isn't quite what you are looking for there are more options available over on Funky Pigeon, so you'll be able to find something or just go and peek for a little inspiration. Remember it's all about those personal touches. This post contains gifted items, but as always my words are my own. 4 comments on "That Personal Touch with Funky Pigeon"
i love nothing more than a personalised anything - for birthdays and big events i always buy cards from Funky Pigeon! I've heard loads about this brand but never ordered anything myself, such a lovely idea for a gift!